WITH the digital revolution came pin numbers, passwords and fingerprints; and the traditional signature is dying out says recent research. Our signature is our name written in a distinctive way as a form of identification, but it seems the days of the carefully honed personal signature are coming to an end! According a national study by UK cyber security consultancy; Online Spy Shop; more than ½ of adults rarely sign their names anymore and 1 in 5 don't even have a proper signature, instead just writing out their name when 1 is required and potentially leaving themselves open to the risk of identity theft and fraud. ► 55% of say they "rarely" use their signature. ► 1 in 5 in the UK don't have a consistent signature. ► 15% of under 24's can't remember the last time they signed their name. ► 4 in 10 signatures written in the UK are to sign for deliveries. On the whole, 20% sign their name so infrequently nowadays that they admit to not being able to produce a consistent signature. Younger people are even less inclined to bother. 21% of those aged 18 to 24 say they don't have a consistent way of signing their name and 15% can't remember the last time they had to do it. Over 55's are little different and may be responsible for keeping the written signature alive for a while yet. 84% of over 55's say they still have a consistent signature, but even among a demographic that grew up with written signatures as the standard, 7% can't remember the last time they used theirs. Regular signature use is 20% lower among under 55's compared to over 55's. According to the study, deliveries account for 41% of all signatures, while parenting related paperwork such as School consent forms and homework diaries account for 10% . Steve Roberts of Online Spy Shop, who commissioned the research believes signatures could still have a place for a while, despite advances in encryption and security. "We're now so used to engaging with modern means of verification, be that fingerprint recognition or simply passwords and PIN's, that the idea of just scribbling our name seems almost ridiculous. So it's no surprise that a significant proportion of us no longer have a definitive, consistent signature to call our own and many of us can't even remember the last time we signed our own name. I don't think it's quite the end of the written signature, but I certainly believe the days of youngsters perfecting a unique, hard to copy autograph to use in adulthood will be a thing of the past, if it isn't already. Although in the EU, digital signatures are legally as legitimate as hand written signatures, the latter is still standard proof of consent in many scenarios, so I'd recommend people take care to ensure their signature isn't easily copied, just in case." ► Choose how you want to write your name, it could be in full or just your initials and surname. The longer it is though, the harder it is to copy. ► Look at other people's signatures and don't be afraid to use your favourite parts for yourself. Is it short or long? Curly or sharp? Do you want to begin or end with a flourish? ► Experiment with your signature until you get the 1 that is perfect for you, while always remembering to make it unique to you and difficult to replicate. ► Select a few signatures and ask a trusted person to see which they prefer and which 1 would be harder for them to forge. ► When you've chosen your signature, practice it again and again as you need to be able to write it exactly the same on demand, when necessary. THE summer holidays are in full swing and Tate Liverpool is the perfect place to enjoy a free family day out. Inspired by the gallery's colourful new display Op Art in Focus there is a kaleidoscopic array of events and activities during August to take part in. From printing playful patterns, drawing multicoloured geometric designs to an Autism friendly session exploring sensory materials, there's something for everyone to enjoy. Op Art in Focus features work by artists including Bridget Riley and Damien Hirst that use lines, shapes and patterns in a special way to make it look like they are moving or blurring. A particular highlight of the display is a rare installation of Jim Lambie's Zobop that floods the gallery floor with psychedelic patterning. Debbie Goldsmith, Curator, Early Years and Families, said:- "Tate Liverpool is bursting with colour this summer with our jam packed events programme. There truly is something for everyone to enjoy and we can't wait to welcome people here." If this exciting programme wasn't enough, children aged 12 and under eat for free in the Tate Liverpool café when an accompanying adult buys a main course from the seasonal menu. The café offers a child friendly menu, activity sheets and crayons for younger visitors and high chairs are available on request. Drop In Event Date and time Information. Monday, 6 August 2018 to Sunday, 18 August 2018. Running each day from 1pm to 4pm. Families are invited to drop into Tate Exchange Liverpool in the 1st Floor and have fun making moving patterns. Participants can collage different sized shapes, swirls, dots and lines to create black and white patterns inspired by the artworks on display in Op Art in Focus. Then stick these creative collages onto a wooden disc, spin it and watch as the lines, shapes and patterns swirl, blur and go wobbly. MOVE ME Wednesday, 8 August, Saturday, 11 August, Wednesday, 15 August and Saturday 18 August 2018, from 1pm to 4pm only on those days. Families are invited to create dazzling designs in the free drop in workshop Move Me. Led by artist Sarah Marsh, participants will make their own printing tools using a variety of materials. Using these tools, participants can experiment with printing straight, bendy and zig-zag lines to make striking patterns. Then they can animate and bring these patterns to life by using the stop motion animation station in the Clore Learning Studio. 11.00 to 2.30 and 13.30 to 15.00 Families are invited to Creative Studio, a hands-on workshop for children with autism and other social communication issues, their siblings, parents and carers. Led by artist Sarah Marsh, participants will make their own sensory inspired printing tools exploring different textures and materials. Using these tools, participants can experiment with printing straight, bendy and Zig Zag lines to make striking patterns. Then they can animate and bring these patterns to life by using the stop motion animation station in the Clore Learning Studio. ZIG ZAG ZING The event is running until 2 June 2019, from 10am to 5.50pm, daily. 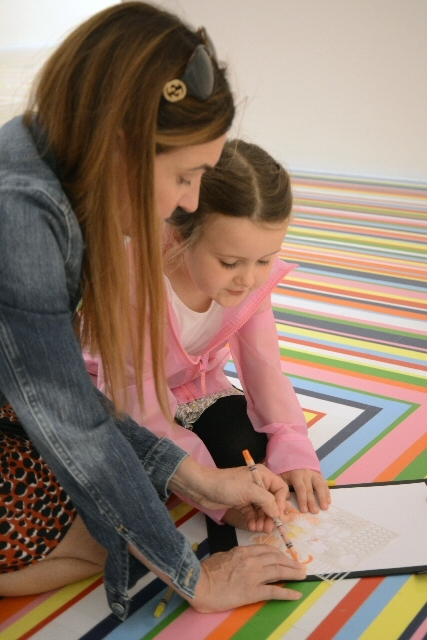 The family learning room in the Clore Learning Centre on the 1st Floor has been transformed in response to the free display Op Art in Focus, featuring artworks that use lines, shapes and patterns to fool the eye and give the illusion of movement. In the space, there will be zig zag dens to play in and families can experiment with arranging everyday objects onto the colourful pegboards to create contrasting patterns. Use the magnetic boards to arrange shapes and make dazzling black and white designs. Families can have fun dressing up and using the props available to perform at the green screen in front of a backdrop inspired by patterns found in nature.